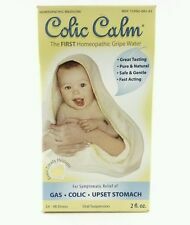 COLIC RELIEF HOMEOPATHIC FAST ACTING/INFANT GAS/COLIC..."COLIC CALM" 2 fl Oz. You get your 100% money back in this unfortunate instance. No regular dosing is needed. Each ingredient has a long history of safe use. Made in the USA in an FDA-inspected facility with the highest quality natural active ingredients. These include pediatricians, family care physicians, natural health care practitioners, pharmacists, lactation consultants, midwives and doulas. 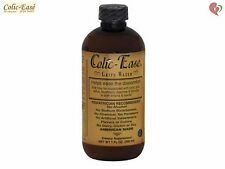 Colic Ease Gripe Water7oz200 ml. A gripe water formula that is also helpful when introducing new foods into baby's diet. Longest shelf life of all gripe water products - unopened 3 years, opened 6 months. Tummy Calm Gas Relief Drops, 2 fl oz/59 Ml New. Condition is New. Relief for Gassy Babies, 2 fl oz. Sporting Goods < Gun Products Sporting Goods < Fishing Fans Heaters Hobbies Photography Headsets, Earbuds Exercize Beach < Pool Computers. We apologize for any inconvenience that this may cause. Prevents Bloating. Safe, gentle and effective in minutes. BEST PRICING. We do our best to process as quickly as possible. width: 2.8 x height: 5 x length: 1.5 x weight HIGH QUALITY. Non-habit forming. Gas relief, digestive aid, calming and soothing. We stand behind our products. New Colic Ease - Gripe Water,7oz(200 ml) by Colic Ease. A gripe water formula that is also helpful when introducing new foods into baby's diet. Longest shelf life of all gripe water products - unopened 3 years, opened 6 months. Gas relief, digestive aid, calming and soothing. Manufacturer Model:313992001017. Safe, gentle and effective in minutes. If you did not receive our reply. And discomfort caused by colic, gas and reflux, this experience. of colic, gas and reflux to thousands of babies and families worldwide. WORKS GREAT FOR THE ENTIRE FAMILY - Did you know that Colic-Ease gripe water works for adults as well From indigestion and heartburn to reflux, nausea and gas, Colic-Ease can benefit your entire family. Gas relief, digestive aid, calming and soothing. We do not accept P.O. Boxes. Gas relief, digestive aid, calming and soothing. BEST PRICING. HIGH QUALITY. Gas relief, digestive aid, calming and soothing. No Exceptions. No regular dosing is needed. Made in the USA in an FDA-inspected facility with the highest quality natural active ingredients. Gas relief, digestive aid, calming and soothing. You will need a suitable adapter to use the item in your country.